“GRSZ” was first published in The Book of More Flesh, October 2002, and it was an Honorable Mention story in the Year’s Best Fantasy and Horror, vol. 16. It was reprinted in Gunning for the Buddha as well as The Best of All Flesh, December 2009. People stopped coming to the North Carolina coast when the dead returned to the beach after four decades away. Got to the point where folks couldn’t sit outside their own beachside trailers with a case of Bud without some rotting corpse staggering up and asking for directions to the cemetery or the bars or the bait shop, the whole time smelling like spoiled tuna. They killed us for most of the entire tourist season before we realized what they were up to and actually did something about ’em. Goddamn zombies. Back then I spent most of my days down at the end of the pier, the longest one in the state, where the stink of fish innards cooking in the sun never got to me like the reek of dead-person guts in some walking corpse did. If you come out to Long Beach—which you should do, even now, with the zombies and all—to fish and swim in the bath-warm water during the day and eat seafood and drink cold ones with us at night, you’d find me there at the farthest tip of the pier, past the signs saying “No Spectators Beyond This Point” and “King Mackerel Fishing Only.” If you give a shout for Big Al, I’d come over and say hey to you, long as the kings weren’t biting. I caught my limit most days by noon, smoking and drinking with the other old men with skin like leather and just enough teeth to hold their Camels in place. After the doc threatened to cut a hole in my neck, I stopped with the cancer sticks, but I still liked a cold Bud while I watched my lines in the salty hot Carolina air. High point of my days that summer came late in the afternoon, when the pretty girls came up and visited with us after a day of sunbathing and gossiping. Oh Lord, to be young again. Their tanned stomachs were tight and their long hair was salty and wet from the Atlantic, and they acted like they wanted to learn about fishing. We all knew they weren’t interested in any of that. They were up there on the pier with us for protection. Because every afternoon, when the tide started to head out, the dead came lurching out of the brush on the other side of the dunes and headed for the waves. The girls don’t want to be alone on the beach wearing just their bits of bikini as the zombies walked past, dragging their coffin lids behind ’em. Couple of the girls even recognized their grandparents, stripped down to their birthday suits, showing off their pale gray skin. That shook ’em up pretty good, let me tell you. Far as I could tell, the girls didn’t have nothing to worry about. 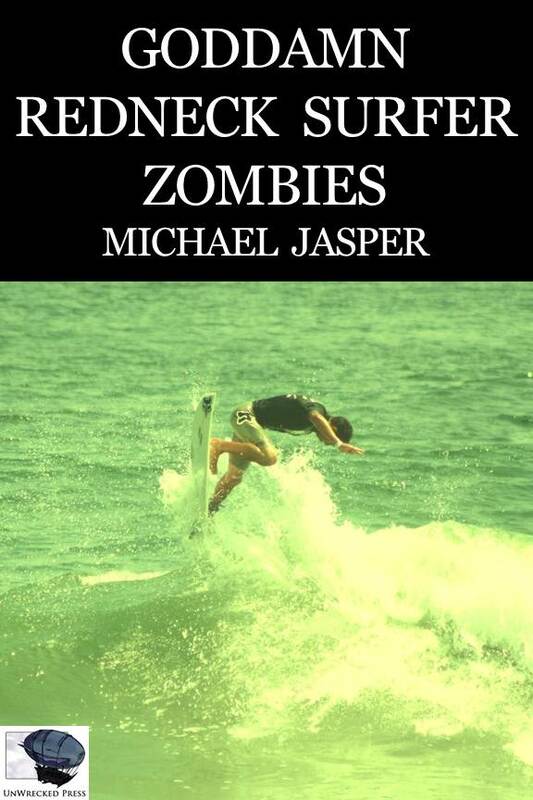 These zombies were here for one thing only—they wanted to surf. We all just laughed and tried not to look at the naked corpses falling off their coffin lids like the newbies we called grommets back in my surfing days. Ten of the dead were out on the water that day, flinging their rotting and bloodless bodies toward the next wave. I recognized Alfie and Zach, old buddies from high school (flipped their car into the Intracoastal Waterway one Saturday night in ’59 and drowned in three feet of water) along with my own mother (lung cancer, ’82) surfing next to four-decades dead Purnell Austin, forever twenty-one. They took some tremendous tumbles, like the time Purnell was launched off his lid by a wave and slammed headfirst into the lid of the rotting girl next to him, sending pieces of nose and teeth flying. That one was so bad I caught myself moving out of my chair toward the water. But the surfing dead didn’t need any kind of first aid, not any more. Purnell climbed back onto his coffin lid, twisted his head with both hands to the left once, hard, and got ready for the next wave with a laugh. Lucky he didn’t lose his head on that one. The zombies’ laughter was like the cough of a lifelong smoker, and it made the hairs on my arms stand up. Must’ve been hard, laughing when you didn’t need to breathe any more. Read the rest of the story as an ebook from Amazon or Smashwords.